Hi friends! Dana Tatar here today sharing a home decor tutorial. 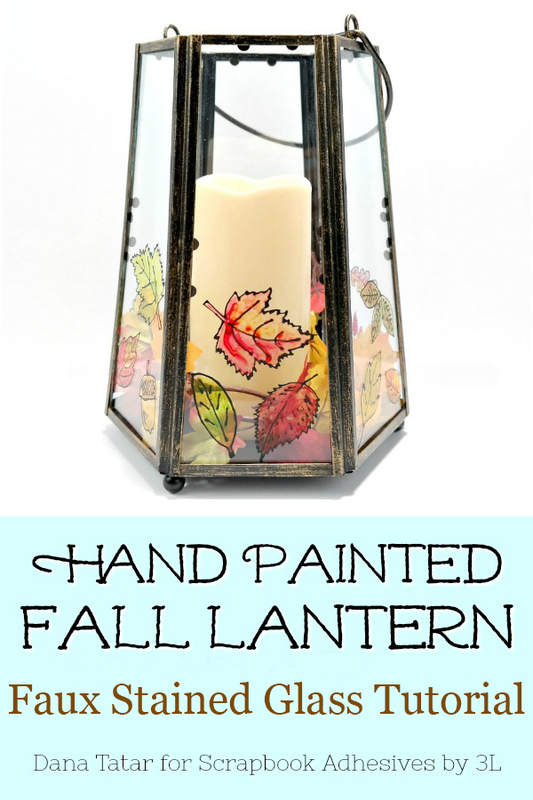 I decorated a plain glass lantern for the season by adding black glue leaves that I then colored with glass paint. 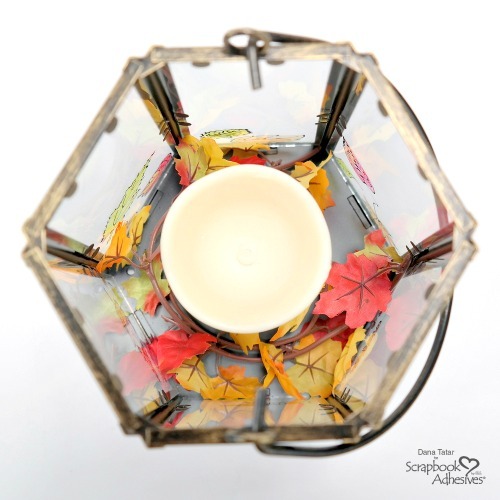 This project replicates the look of stained glass and is a great way to dress up a front porch or table centerpiece for Fall. 1. 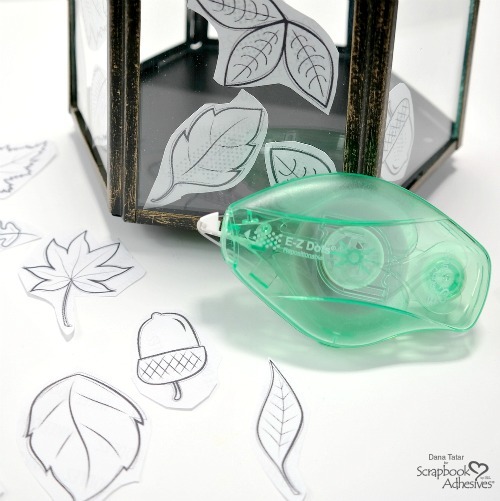 Gather a variety of printable leaves and acorns and cut out. 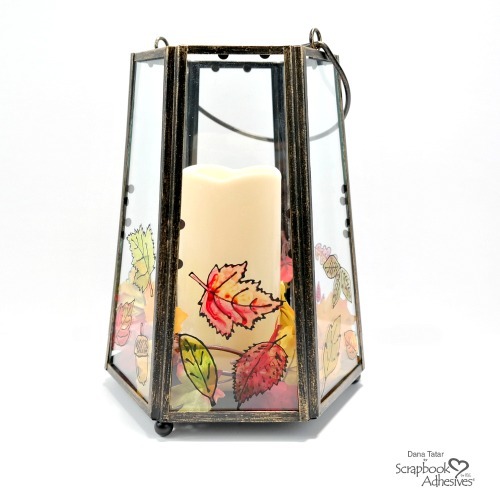 Use E-Z Dots® Repositionable to secure the leaves to the inside of a glass lantern. 2. 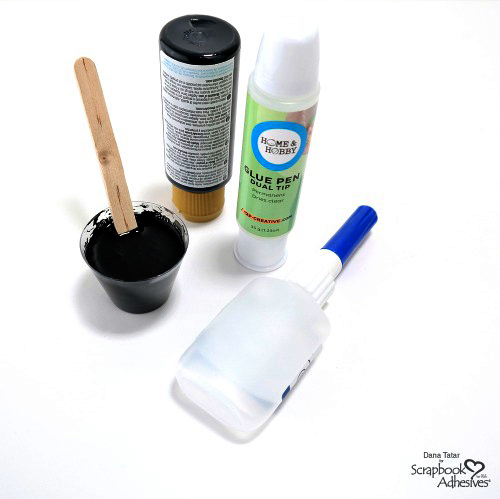 Mix 3 parts of liquid glue from the Dual Tip Glue Pen with 1 part of black acrylic paint. Transfer the black glue into a bottle fitted with a fine tip applicator. 3. 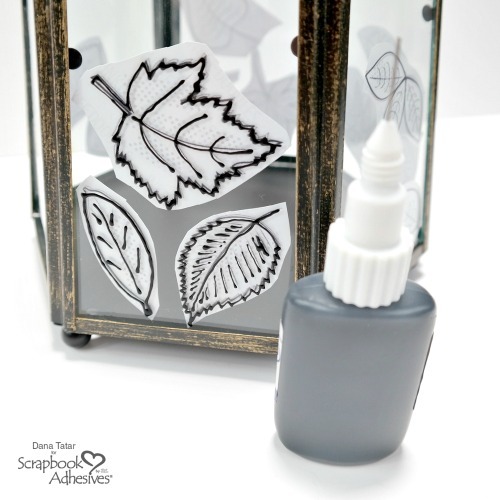 Apply the black glue to the outside of the lantern, using the leaf outlines as a guide. Let dry. Remove the paper leaves from the inside of the glass. Rub off any residual adhesives with a finger. 4. Use a paintbrush to add color to the leaves. Designer Note: I used a specialty ink for glass. 5. 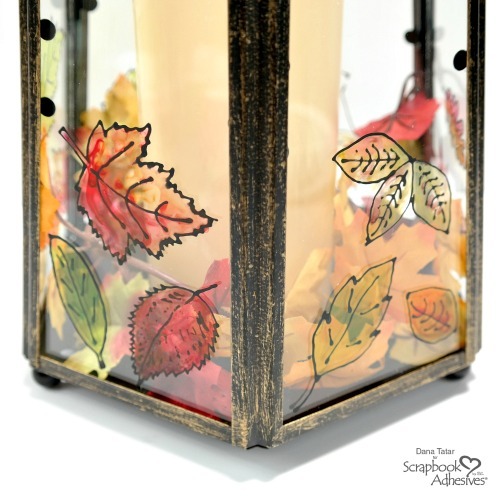 Secure fabric leaves to the inside of the lantern using Large Adhesive Dots. Add a flameless candle to the lantern. Applying a Large Repositionable Adhesive Dot to the bottom of the candle will keep it upright. The colored glass really catches the light in a beautiful way! Try decorating a lantern for Winter by painting holly leaves and berries, snowflakes, or a festive holiday greeting onto the glass. This entry was posted in 3D Projects, Adhesive Dots & Lines, Adhesives, Altered Art, Crafts & Tutorials, E-Z Runner® Dispensers, Fall, Home Decor, HomeHobby by 3L, Intermediate, Mixed Media, Repositionable Adhesive, Seasonal Craft Ideas, Skill Level, Tutorial, Wear your Adhesive on the Outside and tagged Adhesive Dots Large, Adhesive Dots Large Repositionable, Clearsnap, Dana Tatar, DecoArt, Dual Tip Glue Pen, E-Z Dots Repositionable, E-Z Dots Repositionable Refill, Fall, Home Decor, HomeHobby by 3L, Mixed Media, Tutorial, Wear Your Adhesive on the Outside. Bookmark the permalink. 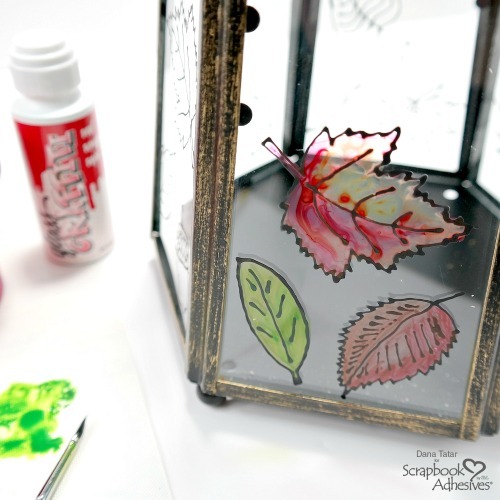 2 Responses to "Fall Lantern with Faux Stained Glass Tutorial"